Leading fraud expert, Linda Webb AKA The Fraud Dog, is proud to be a part of a fraud fighting model used in the insurance industry called the SWARM™. 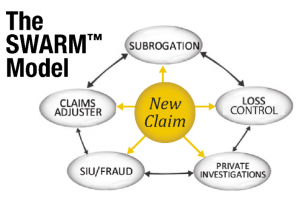 In a recent article in the Claims Journal, Guarantee Insurance Company’s (GIC) President spoke about the SWARM™ service model which has made the insurance provider so successful at detecting fraudulent activity. The Fraud Dog is also President of Contego Services Group, the company utilized by GIC during a SWARM™ activation. Contego Services Group provides all the SIU fraud fighting services used by Patriot National Insurance Group and its subsidiaries. SWARM™, swift working assessment with rapid methodology, an acronym which was coined by Webb herself, involves multiple departments working together to quickly triage a claim and limit exposure on the front end. By working in unison with claims management, Contego is able to collect all the evidence at the scene of an accident, assess compensability, identify possible at-fault parties, as well as, mitigate the claim exposure on the front end. Contego has become so efficient at the SWARM™ service model that in most catastrophic claim cases, its investigators have beaten the medical team to the scene. For the first time in insurance history, The Fraud Dog is proud to have created Contego, a company that has combined Investigative Services, Loss Control & Safety, Subrogation, SIU & Fraud, into one unified cost containment operation. By hand-picking the best in the industry, Webb has produced a company with the top industry professionals, boasting a combined 200 years of experience.